Thornton Cleveleys are setting the early pace in the West Lancashire League after winning four of their five Premier Division matches to date. They made it back-to-back 3-1 wins with a home success against struggling Haslingden St Mary’s. Joel Khambay’s second-minute strike still separated the teams at half-time and Oliver Wilkinson added the second two minutes after the restart. Dom Lawson netted TC’s third and Scott Wylie replied. Poulton are among the three teams just two points behind the leaders as they followed their 5-0 win at Hurst Green with a 3-2 home victory over Vickerstown in which Nick Webster scored twice. Poulton fell behind to an early penalty but Webster made it 1-1 at half-time. Webster and Vickerstown’s Danny Cummings both doubled their tallies early in the second half and it was Josh Few who netted the winner on 76 minutes. 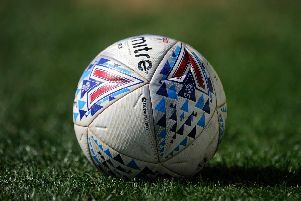 Blackpool Wren Rovers recovered from back-to-back defeats to inflict a first loss of the season on second-placed Fulwood Amateurs. The away side triumphed 3-2 after Carl Eastwood had given them a half-time lead. Wrens found themselves 2-1 down by the hour mark but Tarren Moxon soon equalised and Eastwood’s second on 76 minutes sealed a second win of the season for ninth-placed Rovers. Also recording their second success of the season were Lytham Town in division one. Danny Thompson, Mark Thornber and Ross Ainsworth were the scorers in a 3-1 home win over Eagley. Wyre Villa lost by the same score at Lostock St Gerard’s despite taking a 14th-minute lead through Hass Gorji. Wyre are still seeking their first point of the season after Tuesday’s 3-0 home defeat by CMB. After winning every league game in last season’s Bathroom Solutions Blackpool and Fylde Sunday Football Alliance, AFC Additions came crashing back to earth in their first game of the season. Current Lancashire champions, Ma Kelly’s Showboat, beat them 2-0 thanks to Josh Miller and Ryan Tanser. Appletree Finance defeated 21st Century Windows 3-0 with a Joe Howarth brace and a Luke Robinson goal. Highfield Social continued their scintillating start to the season with a 7-2 win against Bloomfield brewhouse with a brace each for Sam Dyer, Jordan Spedding and Barry Davenport against his former club. David Downie was also on target for Social while Dax Hoogerwerf and Liam Orr replied. Station Lytham played their first game at this level against one of the favourites for the title, Eleven Sports Media, with Callan Rae scoring the opener before Matty Parr headed in a reply,. Mason May put Media ahead before Rick Horrocks smashed home and both keepers made stunning saves to keep their team in the game. In division one, Lee Grundy helped himself to five goals as his team, the New Albert beat FC Kingsfield 9-1. Patrick Adamson, Sean Kenny, Luke Rolling and Matthew Brown also scored for Albert. Goals from Ellis Tester (2), Steven Rankine and Ryan Moore gave Westview a 4-0 win over Wesham. Last year’s top two from division two went head to head, and the team that finished second, the Excelsior, edged out last year’s champions, Clifton Rangers in a nine-goal thriller. There were two apiece for Simon Annetts and Cory sellers and a further goal for Kieran Fairnie. Kenny Cram (2), Jake Thomas and Rob Hanslip replied for Clifton. Blackpool Town’s Jack Lavery scored a hat-trick but it wasn’t enough for three points. Ellis Hulme scored for Town but a brace each from Karl McLeod and Aaron Clarke saw the Layton pull the game back from 4-1 to 4-4. In division two, an Alex Ryder hat-trick and Alex Louden’s brace set Layton Seniors up for an 8-1 win against Kirkham Town. Otis Chambers, Charlie poskitt and Michael Morecombe also scored as Lee Hilton replied. Joey Crookhall, Andrew Davies, Adam Hawkins and John Whittle scored as the Bloomfield beat Fylde Rangers 4-0. Christopher Bardsley (2), Daniel Smith, Andrew Heys and Ryan Searle scored for Little Black Pug as they drew 5-5 with the Mount for whom Ryan Willetts (2), Jack Williams (2) and Callum Hitchon found the net.